Have you noticed more and more dogs wearing backpacks lately? More than just a fashion statement, backpacks offer the perfect place to stow water for a long walk and give working breeds a sense of purpose. Although backpacks can be a good choice for your pet, it's important to consider your dog's size, temperament, and health before buying a backpack. Is a Backpack Right for My Dog? Active dogs bred for a specific purpose, such as herding or sledding, are particularly well-suited to wearing backpacks, although other types of dogs can also benefit. Herding, sledding, and sports breeds generally have sturdier frames and stronger shoulders, which makes it easy to wear filled packs. Working breeds are happiest when they're busy, and although donning a backpack may not seem like much work, it can help fulfill your pet's task-oriented needs. Backpacks aren't just for working breeds. In fact, any dog may enjoy wearing a backpack during hikes, walks around the neighborhood, or visits to the local dog park. Some dogs don't like anything on their backs and may never adjust to the sensation, no matter how slowly you introduce the backpack. If that's the case, there's no point forcing your dog to wear something he or she hates. It's also important to consider your dog's health. If he or she has arthritis, hip dysplasia or another joint condition, a heart condition, breathing issue or other health problem, it's best to consult with your veterinarian before using a backpack. Adding extra weight to your dog's back may worsen or cause health problems in some cases. What Factors Should I Consider When Choosing a Backpack? Size and Comfort. Backpacks should fit comfortably. Although your dog's weight plays a role in the size you choose, it's also important to measure the circumference of his or her chest to determine the best size. Look for backpacks that feature padded straps for maximum comfort. Check the fit regularly and choose a larger bag if you can't fit a finger or two under the straps easily. Fabric Type. Breathable, waterproof fabrics are best. Your dog won't want to wear the pack if it causes sweating. Age of Your Dog. Backpacks may not be a good idea for puppies or older dogs. Ask your dog's veterinarian for guidance if you have a younger or older dog. Weight. Thanks to that new backpack, your dog can carry water bottles, collapsible dishes, food, and poop collection bags during your hikes. Make sure you don't add too much weight to the bag, as excess weight can cause joint issues, spine curvature, sprained muscles, breathing difficulties, or loss of balance. Cesar's Way suggests filling the pack with items that weigh no more than 10 to 12 percent of your pet's body weight. How Can I Convince My Dog to Wear a Backpack? Some dogs instantly adjust to wearing a backpack, while others may need a little encouragement. Start by placing the pack over your dog's back without fastening the straps. Let him or her walk around with the unfastened pack several times before you fasten it. A few treats may make wearing the backpack a more positive experience. Once your dog has gotten used to taking walks with the backpack fastened, add a lightweight item, such as ball, small toy, or water bottle. Gradually increase the weight to avoid straining or overloading your dog's muscles and joints. Walks should be kept short until your dog adjusts to wearing a fully loaded backpack. 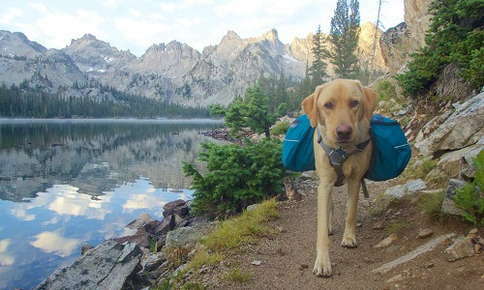 Health is an important consideration when choosing a backpack for your pet. If you're not sure if a backpack is a good choice for your pet, give us a call to schedule an appointment.